Video Poker is one of the very first casino games that still remains popular today. In fact, the first slots provided card symbols, from which other symbols were added, and slot machines were started. Today, video Poker consists of a huge gaming selection, which is available at casinos around the world as well as online casinos. The games provide some of the highest payout rates with some percentages over 100%, meaning the casino has no house edge on the game. Standard video Poker games provide payout rates of 96% to 99%, making the house edge very small and the games a lot more rewarding that just about any video slots. Unlike video slot, these games come with various options that require players to take action and achieve winnings. This means it’s not just about spinning the reels and winning as you would need to choose hold cards, create combinations, and win when a worthy combination appears. This is fairly easy, though, but for the best results, you would need to know what the Poker hand rankings are and what they entail. All forms of video Poker are the same, and the only differences are that some forms of video Poker include additional features such as Jokers. However, you can play one of the forms of video Poker, the other games are easy to adapt to and learn as the same options and gameplay settings are used. Here we go through what video Poker is and all the types of games and features you will find online and with land-based casinos. Texas Hold’em is the most popular variant of Poker out there, which is why video Poker is based on the same rules and rankings. This means any variant of video Poker will use these ranking to provide winnings and complete combinations. Here are all the possible hands for a standard variant of video Poker such as Jacks or Better. Royal Flush – A Royal Flush is the best hand you can bet in video Poker, which requires a hand with 10, J, Q, K, A, all consisting of the same suit. Most variants of video Poker provide 4,000 coins for this hand. Straight Flush – Straight Flush is the second highest payout with winnings up to 200 coins. This requires a combination of 5 numerical card values with the same suit. For example, 4, 5, 6, 7, 8 of hearts. Four of a Kind – Four of a kind is the biggest combination you can get with cards holding the same value such as four J’s or 5’s. Ant hand with 4 cards of the same value will provide winnings of 100 coins in standard video Poker. Full House – A Full House means all the cards are involved in some type of combination such as 3 of a kind and 2 of a kind in the same hand. A typical full house is 5, 5, 5, 7, 7. As you can see these are 2 combinations in the same hand, which will provide winnings of 45 coins. Flush – Flush is a 5 card hand that provides the save suit. These cards can be of any value as long as they are all hearts, spades, clubs, or diamonds. These combinations usually offer 30 coins in winnings. Straight – A straight is a hand with 5 consecutive card values such as 6, 7, 8, 9, 10, with mixed suits. This means each card can have a different suit, as long as they are con a consecutive order. These provide rewards of 25 coins. Three of a Kind – Three of a kind can be any 3 cards with the same value and mixed suits. For example, three K’s, 7’s, or any other combination involving the same 3 card values produce a winning of 15 coins. Two Pair – Two Pair is the second lowest hand in video Poker and simply requires 2 pairs of 2 cards. For example, two 2’s and two 4’s will create a 2 pair. These offer winnings of 10 coins while playing maximum bet. Jacks or Better – Jacks or Better is the lowest possible combination in video Poker. This requires a pair of Jacks or Better, meaning a pair of 10’s or anything lower will not provide winnings on its own. These offer payouts matched to your bet value. Betting in video Poker is very important as this will determine the winnings achievable. In the pay table, you will find there are different values next to each possible combination. These values refer to a number of coins wagered. Most variants include 5 values, which refer to 1 to 5 coins wagered. If you choose 5 coins per hand, the highest jackpot amount is increased to a huge value, and all other payouts are multiplied by 5. However, this also means your wager value would be 5 times higher. This bet can be adjusted between rounds and players will still have the opportunity to choose various coin denominations to apply to these coins. Jackpot winnings such as a royal flush on Jacks or Better starts from a 250 coin win when playing with 1 coin, 500 coin win when playing with 3 coins, 750 coin win when 3 coins are used, 1,000 coin win when 4 coins are used, and a massive 4,000 coin win when 5 coins are wagered. The other winnings are simply multiplied by 5 from their lowest value when the wager is increased to 5 coins per hand. There are various types of video Poker as mentioned above. Jacks or Better is the most popular and standard variant of the game, which includes straightforward rules, game options, and settings, which is why it is also the most recommended game to start with. The payouts mentioned above are based on Jack or Better and the difference with other video Poker games is features and a modified pay table. Here are all the most popular video Poker games for casinos both online and land-based. 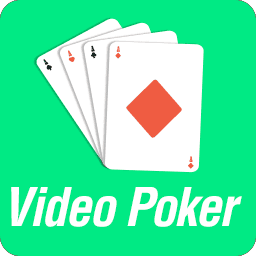 Some developers have created their own variants of video Poker, generally this includes slight changes to the games mentioned below, however, the ones we’ve listed are the most popular and offer the biggest payout rates. Jacks or Better is based on regular Poker hands and does not include any bonus cards such as wilds or jokers. Players can enjoy the features of the game with a single hand or multi-hand variant, which both require Jacks or Better to provide winnings. 10’s or Better is popular as players will receive the Jacks or Better winnings for combinations involving at least 2 10’s. The game still offers the same jackpot winning for a royal flush, but provides decreased winnings for other combinations. However, these winnings have not been decreased by a whole lot as the payout rate still remains very high. All American video Poker is also a popular game, which has been based on Jacks or Better with a modified paytable to offer higher winnings for straight and flush hands. To provide these additional winnings, the payouts for a two pair and full house has been reduced. All other payments remain the same as Jack or Better. Jokers Wild video Poker provides additional Joker cards and also includes a modified pay table. This game will not provide winnings for pairs of any kind but will include an additional winning for 5 of a kind as the Joker can fill in for the 5th card. Deuces Wild and Jokers Wild is very similar, but instead of having additional jokers added, all the cards with a 2 value will become wild and provide better winnings. The pay-table has also been modified only to provide winnings from 3 of a kind. However, other rankings remain the same, and a 5 of a kind reward has been included. Bonus Poker is similar to Jacks or Better as no additional features have been added. However, players will find a modified pay table, which offers additional winnings for four of a kind combinations. The game will also provide rewards for Jacks or Better but has decreased the winnings for two pair combinations. Double Bonus Poker is a more advanced variant of Bonus Poker as it includes more payouts for 4 of a kind combinations. For example, a hand with four 5’s to K’s will offer the 5th highest winning, four 2, 3, or 4’s will offer the 4th highest winning, four Ace’s will provide the third higher winnings, and finally a straight flush and royal flush offer the jackpot payouts. Jacks or Better is still paid, but the winnings for lower combinations such as two pair has been decreased. Double Double Bonus Poker is yet another version of Double Bonus Poker, and includes similar payouts as mentioned above, but here you can win even more when 4 of a kind combinations appear with an ace. Getting four Ace’s also provides a huge winning and players will still have the opportunity to receive winnings for other combinations down to Jacks or Better. However, all the winnings for combinations up to a Flush has been decreased. Video Poker is actually very easy to play once you understand how the game works. By now you should understand the different combinations available to reach winnings. Joining a video Poker game will require a bet, which starts from just £0.01 and can be increased to much bigger values for higher winnings or multi-hand games. Once you’ve joined a game and set the bet value to what you prefer, press deal. At the bottom of your screen, you will see 5 cards that flip open and show their face values. From these cards, you can check for any combinations, which can be clicked on to be held in place. Should there be any cards, you do not wish to keep, simply press deal again, which will replace those cards and end the round. The game will check for any combinations, which depends on the game you are playing and provide winnings according to the pay table. Many of these video Poker games also include a gamble feature, which is activated after each win. This is an optional feature that provides a card guessing game to double your winnings. Guess the color of the next card to either double your cash or lose it all. Players can choose how many times they would like to double their winnings, but keep in mind one wrong guess, and all those winnings disappear. Multi-hand video Poker is like playing 5, 10, 25, 50, or even 100 games of video Poker at the same time. The screen will be fill by all the hands you are playing at the same time but held cards are selected from a single pack. This means you get to choose the hold cards for all the hands played from a single deck. Each hand has their own deck of 52 cards, meaning it’s not only one deck distributing cards to all the hands played. The bet value would be a lot higher on these games as a bet needs to be placed on all the hands. For example, if your minimum bet is £0.01 and you are playing a 50 hand game, your minimum bet would be £0.50. The same winnings will apply to each hand, which could lead to some large winnings when your hold cards already form a combination as that combination would be featured on all 50 hands. Playing the game works exactly the same as playing regular video Poker, meaning you still press deal to see the first 5 cards, choose your hold card that is applied to all the hands, and press deal again to have the other cards replaced. Most casinos offer demo-versions of each game. Demo-mode is a great way to learn how to play a game, but it is honestly not that fun when you can’t win money on it. We therefore recommend you to look for no deposit bonuses that allows you to play Video Poker. Many casinos excludes Video Poker from the wagering requirements, but it is still possible to find bonuses for Video Poker. Below is a demo version of the popular Jacks or Better double up game from Casumo.